The following courses provided by American Electrical Institute are approved by the Florida Electrical Board. These course expire on May 31, 2019. You may have already received our book in the mail. If you are ready to take the test online, you must first purchase the course using the BUY NOW button below. The test online is identical to the exam in the book. If you did not receive our book, you can request one here. Once you purchase the course you will be taken to a receipt page which has a link to take your final exam. This link will also be emailed to you. Returning Students: To resume a course you started online use the link in the email receipt sent to you after your purchase. Contact us if you have any questions. Florida 14 Hour Renewal Package – SAVE $35! In order to renew your license, the Electrical Contractors Licensing Board requires you to complete 14 hours of board approved continuing education every 2 years to renew your license. At least 7 hours must be on technical subjects (T), 1 hour on workers compensation (C), 1 hour on workplace safety (S), 1 hour on business practices (B), 1 hour of laws and rules (L/S) and 1 hour of advanced courses (A). The other 2 hours can be any of the above topics. Our 14-hour package above will meet all of your continuing education requirement needs. See below if you have an alarm system license. Contractors who are engaged in alarm system contracting are required to take a 2-hour false alarm prevention course (FA) as part of their continuing education. If you purchase our 14-hour package, we will include the 2-hour False Alarm course for free! You need to contact us to request the free course. Once you pass the course, you will be able to immediately download your completion certificate. We will also report your hours to the Florida Electrical Contractors Licensing Board. Click here to view our state approval. Do you report my hours to the Florida Electrical Contractors Licensing Board? Yes, we report all continuing education results to the Florida Board. Do you provide me with a certificate of completion when I finish the course? Yes. Once you complete and pass the continuing education course online, you will be able to immediately print your certificate of completion. Can I take the courses on my phone? Yes. Our Florida continuing education courses are mobile compatible. The certificates are for your records. We will submit the hours to the state for you. Do you renew my Florida license for me? No. 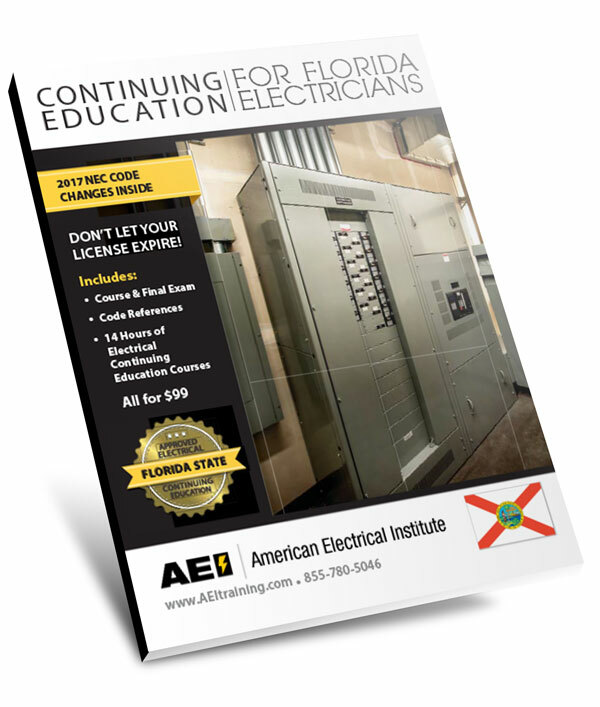 After you complete the continuing education hours, you will need to pay the Florida Electrical Contractors Licensing Board the renewal fee, as we cannot do that for you. Do offer any continuing education training that is not online or correspondence? We only offer online and correspondence continuing education courses in Florida. We do not offer any classroom continuing education courses in Florida. We find that most students prefer to complete their courses on their computer, smartphone or tablet. What if I still have questions about completing my electrical continuing education? No problem. Just call our continuing education specialists at 855-780-5046 or email us at electricalceu@gmail.com.